I'm such a Looney Tunes/Merrie Melodies fan...I can't get enough of these shorts! I hope there aren't too many ads on this video, I have Ad Blocker so I don't see them! ...speaking of that, the sixty pounds of potatoes that I harvested last September have served us well! We went through about 45 pounds already, holy potato! The last 15 pounds or so were starting to grow "eyes" so I took Mama Pea's advice and canned them. I kept 5 pounds of the best looking ones so that we still have some potatoes for french fries or baked potatoes. I realize that the next time I set up my old tires to plant my potatoes, otherwise known as my "tater tires", I will have to double them up!! Also, I need a proper root cellar! I checked the temperature in that unheated basement room and it was at about 10 Celcius (that's 50F)...not cold enough? What's Rain's kitchen without a pizza? :) This is a vegetarian version of my BBQ Chicken Pizza. Most of the river around the village is covered with snow, only a few spots near the little waterfall are still showing the raging current. I'll tell ya though, I wouldn't want to be in that water. I'm still trying to take my daily walks with Charlie despite the deep freeze. She does pretty well with the boots on her! My arm injury is healing well (I strained it shoveling snow), I can function very well again despite still being one-armed most of the time; but I'm thankful that I have one good arm! This week we have rain and snow in the forecast, then back to winter by the weekend. Crazy weather! "Tater Tires" LOL! Great name! As always, your food looks great. You have a lot more snow than we do right now. 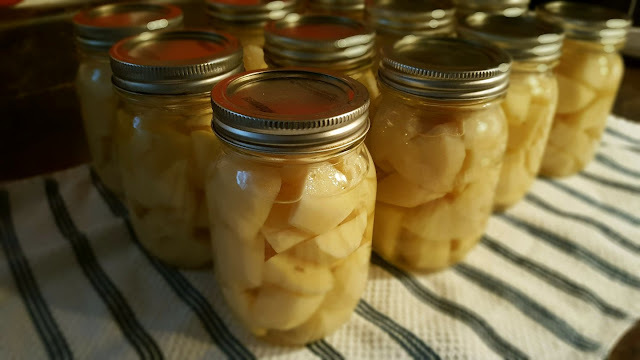 I canned potatoes once, and really don't ever want to do it again. I had to borrow a pressure canner to do it. A pressure canner is still on my wish list. Have a great week. Thanks Kristina :) I love my pressure canner, it's been on my list for years too and I finally got it last fall, I'm so happy with it! Love your market piece Rain, and your food always looks sooo good! Glad your arm is getting better. 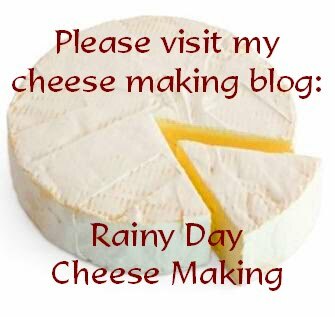 It all looks so yummy there in your home Rain - you do such amazing things with your produce etc. What would life be without the lowly potato. 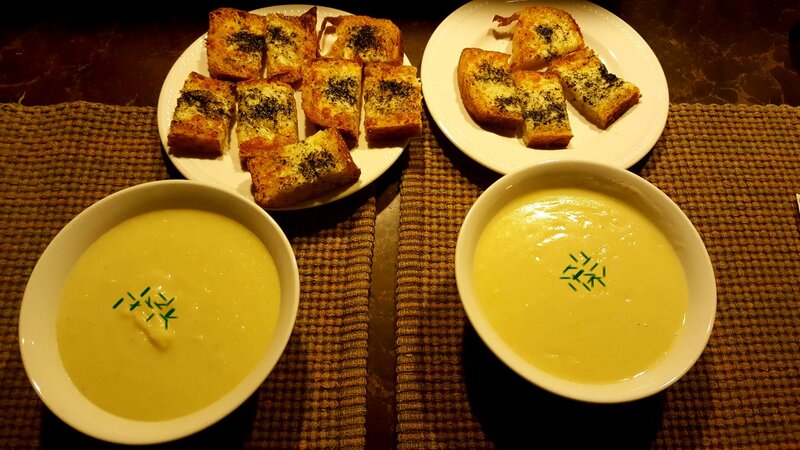 I made leek & potato soup again yesterday - always a favorite even though it's not at all cold here this week! I always chop my leeks quite small and never use the stringy/tough dark green tops, just the white and as far up as the pale green - my soup is never stringy! We like to have the first bowls chunky - I just mash it a wee bit to thicken, then sometimes completely puree the remainder with my stick blender for next time. Love your fun art today - and fresh field grown tomatoes can't come soon enough. Sorry about your arm problem, I'm fighting shoulder/arm pain right now - PT not doing much to help so had injections this week which helped somewhat. Need our precious arms to stay busy - hope you continue to heal quickly. Hugs - stay warm and watch out on the ice. Hi Mary :) Oh, I hope your shoulder and arm heal soon! It's not fun to have an injury. Though it makes me appreciate my limbs that much more! Thanks for the tip about the green part of the leeks. I try to cut them close enough to the green, but not too close...I probably have too much green stuff in my soup! I bought a huge bunch of leeks last fall and froze them, so for the next soup I'll try to remove as much green as possible! Hate those stringies!!! Never heard of canning potatoes! But leave it to "Mama Pea" to have a solution!!!! 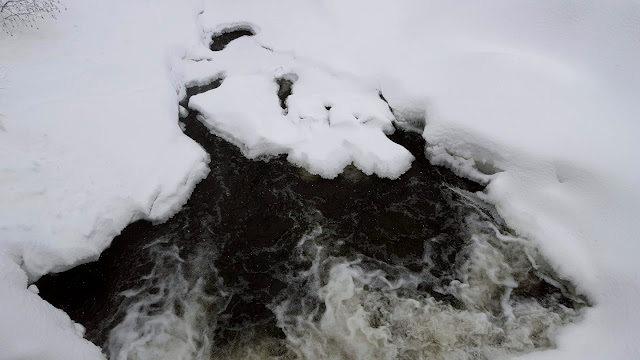 Don't get too close to that snow-ed-over-river. But that bit of raging water, is a beautiful photo op. We are in that up and down temps time too. Guess the Jan. Thaw came a little late, this year. Hi Wisps of Words :) Oh you can can pretty much anything, though I've read on the National Center for Home Food Preservation's site that you should avoid canning dairy, fats and thickeners. Though I've read on some blogs that people do it anyway! I try to keep on the safe side though. Heaven only knows how many potatoes you will end up with when you have your own homestead - you can corner the Canadian market! I love Charlie's boots - I am thinking of trying some on Lovey, as she is better at tolerating clothing. The Pat would have them off in a NY minute. Your food always looks so good and comforting, Rain. charlie looks so cute in those boots! the taters served you well....hell, i could live on potatoes! potatoes and cabbage is one of my favorite dishes. it's pouring here today and i have some very unhappy chow chows! Hi Joyce :) I could live on taters too. I just wish I had more of them!!! Oh your poor W's...they must soak in the rain when they go out! I'm not sure what temperature a root cellar should be but I'd like to know too. I keep some stuff in my garage but then we have days like the other day when it was 72F and that is way too warm but my basment is heated so that's a no go. 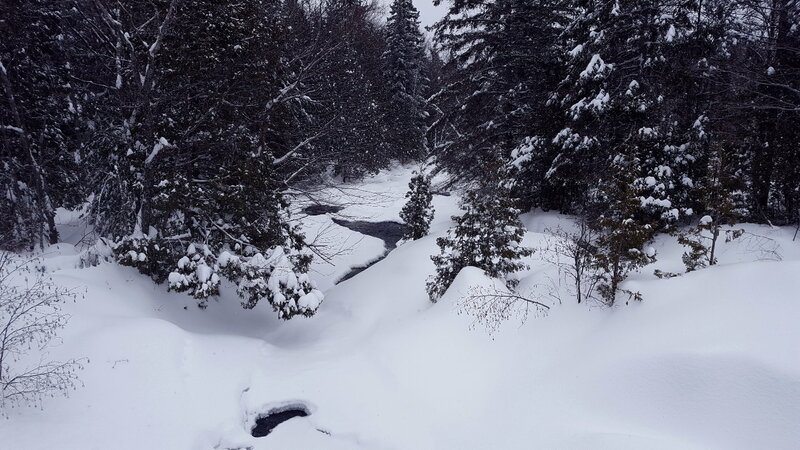 With the snow covering the river do you have to be careful you don't accidentely walk into it? Good for you canning potatoes! Mama Pea is a wealth of knowledge and did you see her picture of her garden last summer? It's my dream garden! You make me so hungry with your food pictures! Great use of your potatoes too! 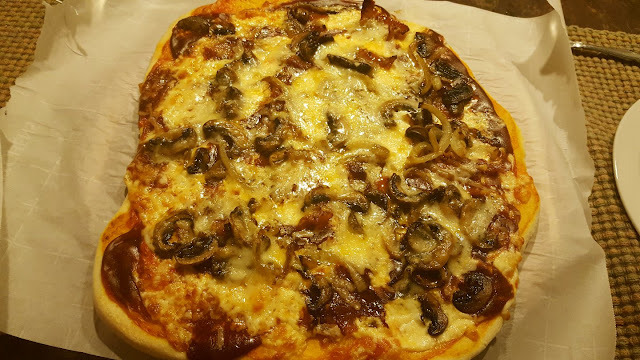 I'm going to get back to pizza making and I think I'm going to try a sourdough crust. Wish me luck! How do you 'flash freeze'? On a cookie sheet? Your tater tire garden was brilliant, Rain. My favorite soup is potato leek soup. I use a hand held blender to purée it so there are no gritty pieces. Yes! The flash freezing...I washed, dried and cut up the chives then put them on a baking sheet for an hour. They froze up quite well and then I quickly dumped them into a tupperware for the freezer. They didn't clump together at all! I did parsley, cilantro and basil the same way and so far so good! The river is so dangerous these days. I won't walk on it anymore unless we have at least 24 hours of a deep freeze! Some people have skidoo'd across it even though there are patches of thin ice or open water, they are idiots! Hi Starting Over :) Thank you! I loved the tire experiment last summer! I'll be using it again in my future garden for sure! I puréed mine with the stick blender too but I think I used too much of the greens, so that's what made it more stringy. Last year we had a huge bumper crop of sweet potatoes and like you I have no real root cellar so I canned them. Took time to peel but so glad I did them up this way. Have made many a batch of sweet potato muffins that my husband loves. 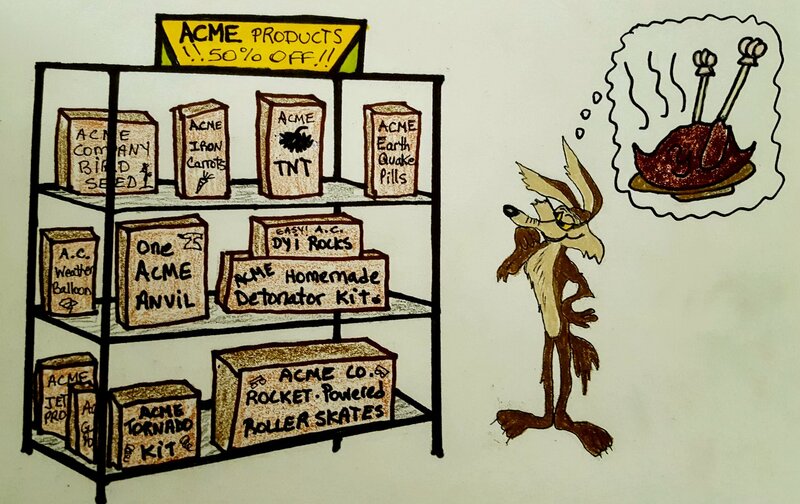 Ah, Acme - What do they not make? Please be mindful of the arm. Hi Donna :) Oh yes, the peeling...that was a pain. I have to find a better way to peel stuff. I'm happy I canned these, though I do want a root cellar one of these days so we can have baked potatoes all year! Hi Rain! What in thunder happened to your arm? I was wondering if you can grow sweet potatoes up there, as they gave me quite a wonderful harvest last year, and seem to keep better than the little red potatoes that we love... I cut yellow squash and zucchini this summer and put them on parchment paper and froze them and they are fabulous to have... pop them in soup, or in an omelet, or in a spaghetti sauce, and the best part is that none of them spoiled! I have also done peppers, and chilis like that. Hope your healing is quick, and please don't overdo with the storms this month. Hi Andrea :) Thanks so much for your sweet comment! :) Better late than never for your art, I really enjoyed your market piece!! Oh a post vacation diet...hmmm...what's THAT??? LOL...I don't think the word "diet" (in the sense of weight loss) has entered my vocabulary in decades lol! I JUST flash-froze some zukes!! We have a really great year-round market here and I got some zucchinis 6 for $2. They will be in soups this winter, thanks so much for that tip! I'm sure I could grow sweet potatoes. I never have because Alex doesn't like them, but I thought about a small crop for myself one of these days when I can organize myself!! Hi Becki :) Thanks! The running water is lovely but it's so dangerous! I have to be very careful when I walk along the river and the lakes here!! Hi Nancy :) Oh I hope your arm is okay! I once got shots (prepare to cringe) in the arches of my feet to help me walk. After burning out the meds I was taking killed my metabolism and I gained about 100 pounds really quickly. My ankles and feet couldn't handle it and I walked with a cane for 2 years! Those shots helped so much, but ouch, they hurt! It's always a pleasure to look at photos of where you live. Seems so peaceful and beautiful. I particularly liked the one with your dog wearing her little boots. Good idea! Hi Harry :) You're right, this is a quiet village (for the most part!) but the snowmobilers are here in full force lately, sigh! Looks like we'll be buying a place this spring for sure though - (fingers crossed) as long as we find something we like! So hopefully we'll have a quieter life than right now! When it's -25 out (-13F), the dogs need some extra help. Some yahoo made a comment the other day when I was walking Charlie that I was putting "slippers" on her and he laughed. I just ignored him, people have no clue that the dogs' feet can get cold just like ours!! Hi Sandy :) Thanks for the tip about the tires! I've used tires for two seasons now and I'm thrilled! Though it's a little tough to harvest them at times, it's so worth it. I'm hoping I'll be able to grow some potatoes this summer, we'll be moving so it may or may not happen, but I'm definitely sold on the tires now! 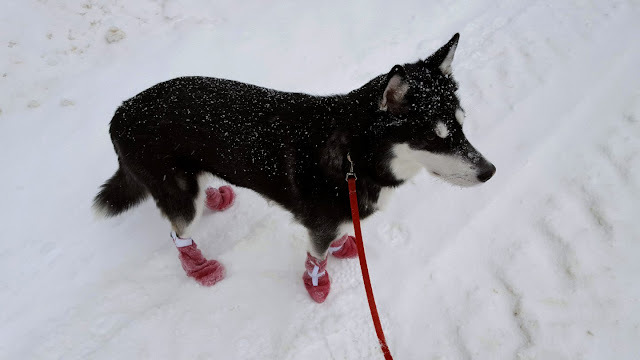 :) The boots are so helpful because even our husky with her hairy feet (!! )...she hops around when it's really cold out! Your soup and pizza look so good. Whenever we have a bag of potatoes to get through we go through a lot of butta. I bet Charlie is so glad to have those boots on! A much needed accessory for those cold and snowy days! Oh my gosh, love the food pics. It all looks so YUMMY. Love that term TATER TIRE! Thanks Pam :) The little dog boots are helping them a lot, it's so cold out! Tater Tires, yeah, funny huh? My friend Joyce came up with that one! 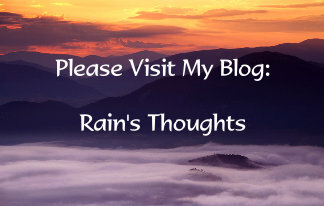 Loved each bit of this post ,so much to enjoy and to LEARN specially! Thank you Baili :) 60 pounds of potatoes...wasn't enough for our winter meals though, maybe next time I'm able to have a garden, I'll make sure I double up the tires!! I am so happy your arm is healing well! You are so amazing with your food! You truly are Rain! Your puppy looks so cute! Love the snow photos and your art is great! Love both pieces! Big Hugs! I'm so sorry for missing this entry to the SP challenge. I'm not sure what's wrong me except I'm a bit overwhelmed trying to do more than I think I should. Anywho, I just love all of your sketches, naturally, the Wiley Coyote is my purrsonal favorite. 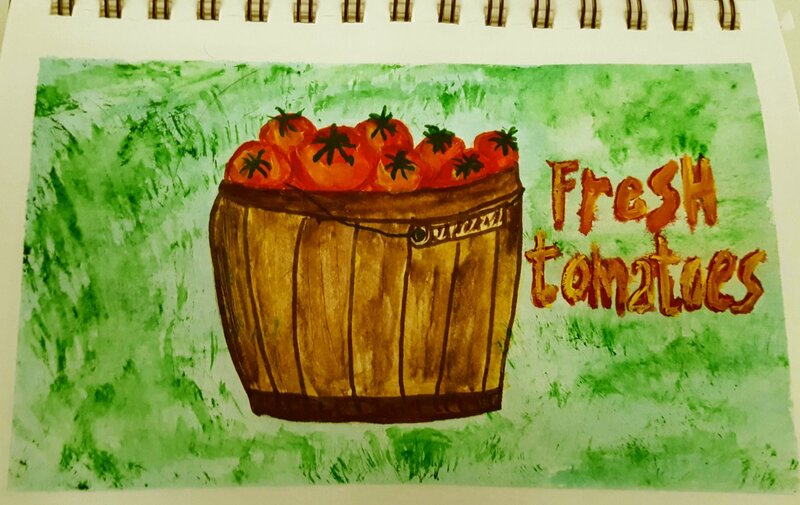 The fresh bushel of tomatoes sure to look good, too. I love the garden ripen tomatoes!! That's something I hate buying from the grocery store but over the years I've learned to look for a local source that generally produces some satisfactory tomatoes. However, I'm telling you the tomatoes my in-law grew years ago were the BEST ever! You sure do a lot of canning. That's just pAwesome! The food looks so delicious. I haven't had 'tarte au sucre' in such a long time. That PEI house really looks cozy. I am positive too you will find something...April will bring tons of new listings.